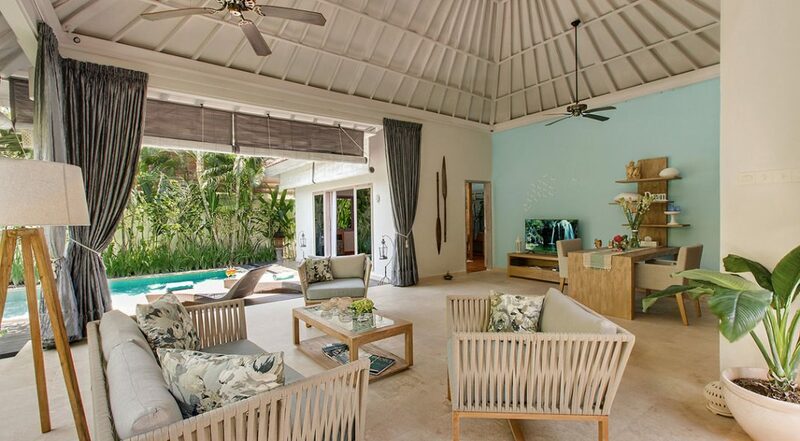 From $ 360AUD per night We have direct contracts with most villa owners. We don't add any booking fees. We are 100% transparent with no nasty surprises. 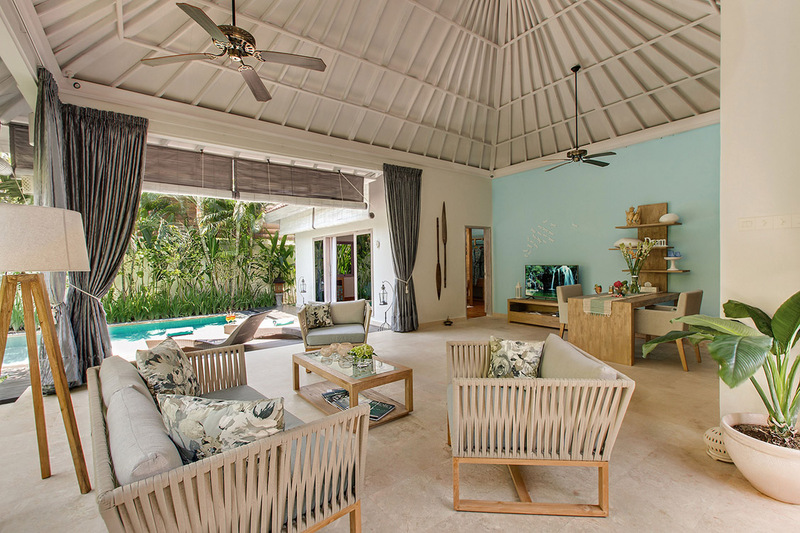 Only 500m to Ku De Ta beach - rent this now! 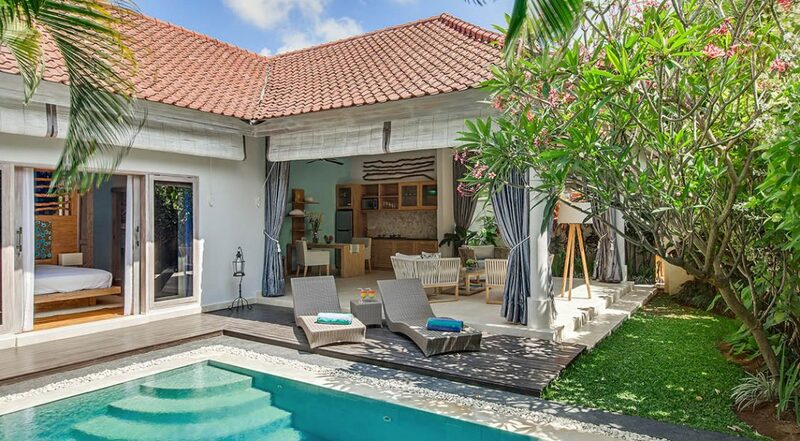 Villa Sky is the perfect little 1 bedroom Seminyak holiday villa rental for a romantic escape with your partner. 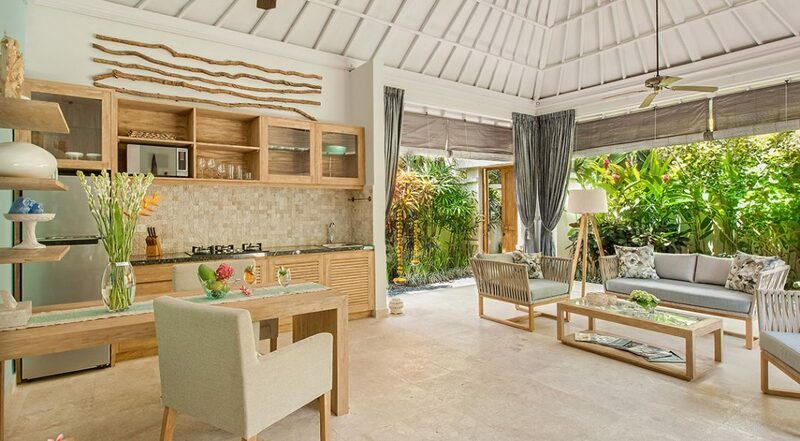 This one bedroom villa has all the essential elements, a gorgeous private pool, charming living areas and very comfortable accommodation along with great in house villa service by a team of friendly staff. 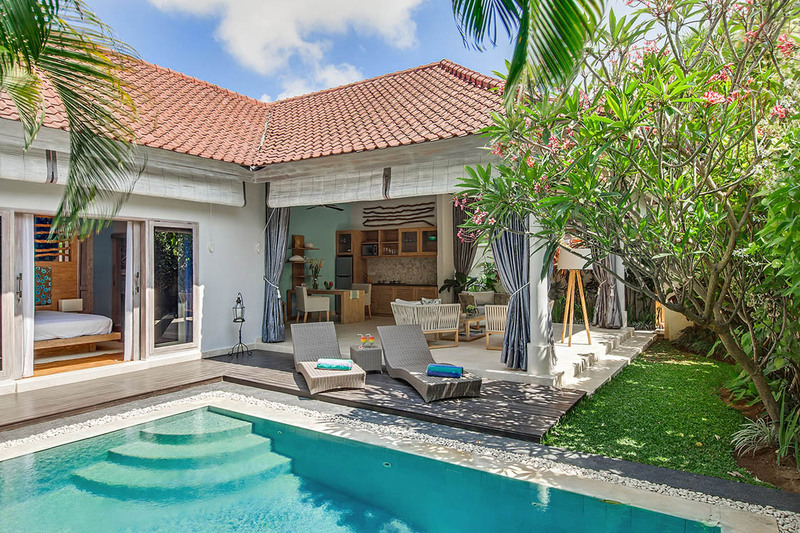 The villa also boasts a fantastic central location so you can explore wider Seminyak and Legian, best of all the beach is within easy walking distance. 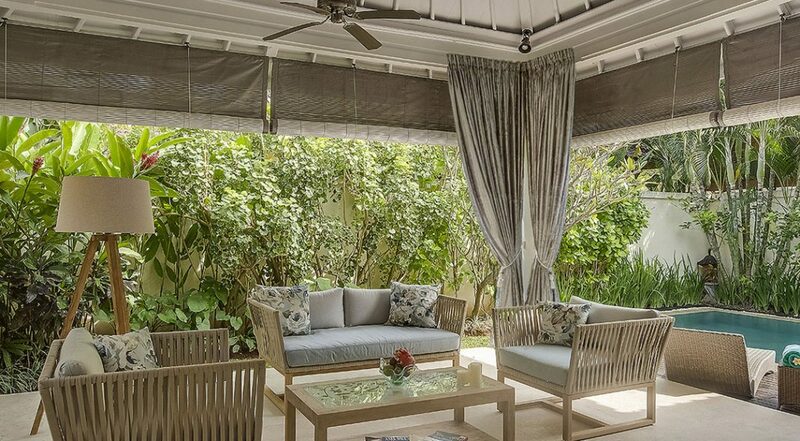 If you love your food, shopping and sightseeing then this has got to be the villa for you. 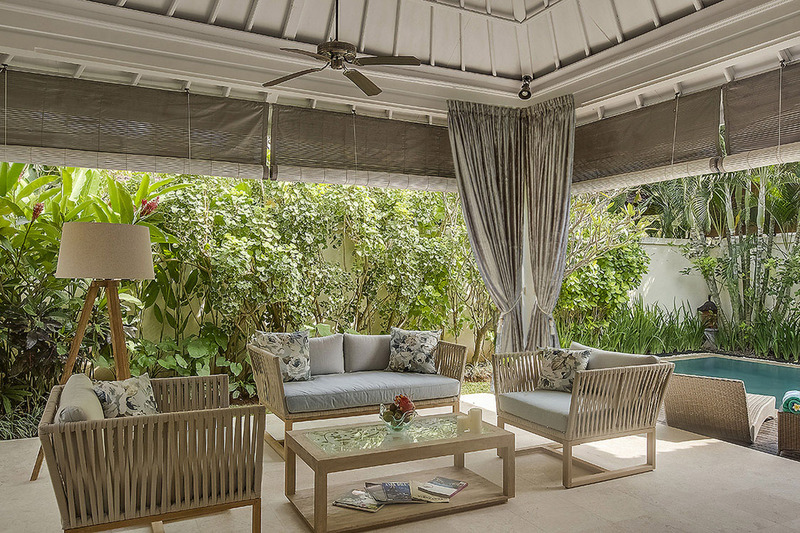 As soon as you walk into the garden you a sense of peace and calm will take hold, the garden is well maintained with abundant exotic greenery and flowers. 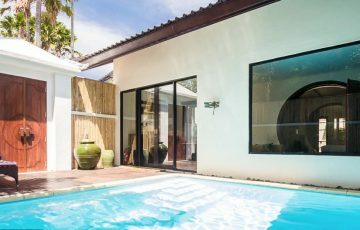 A high wall gives you privacy and the pool is perfect to cool after a walk around town or a few hours lying in the tropical sun. 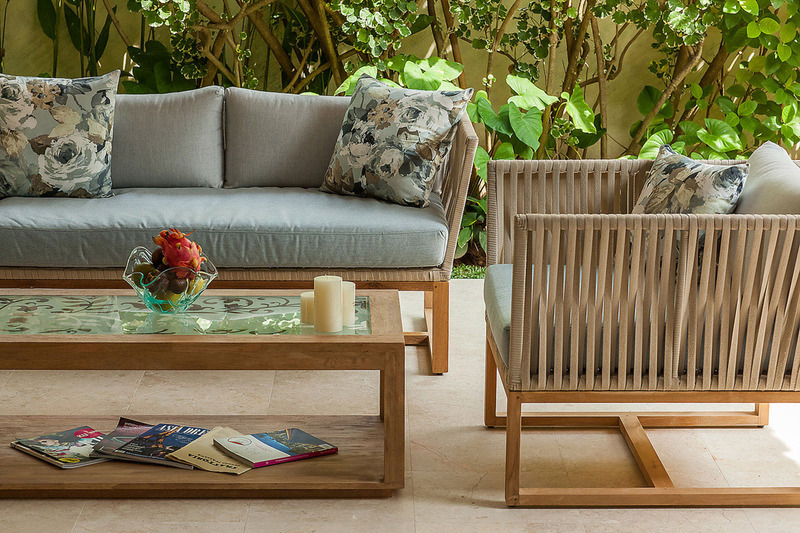 The timber deck has rattan lounges, lay back relax with a cold drink and drift away. 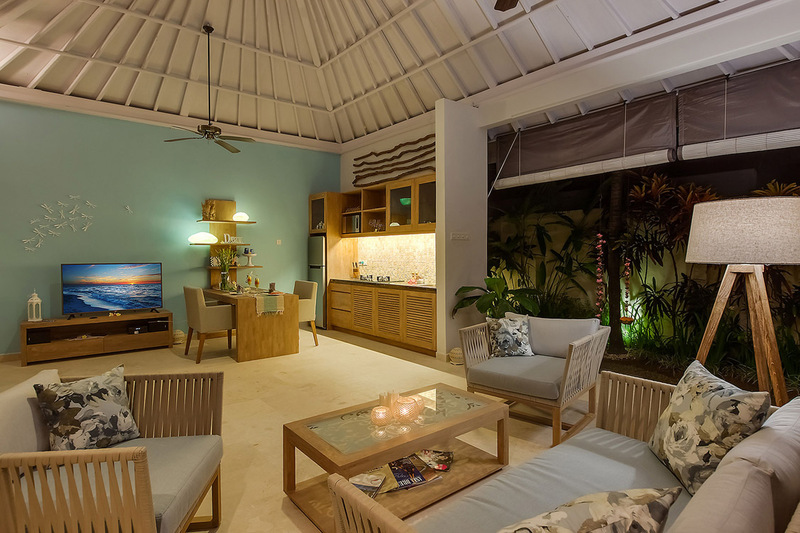 The living area is open-air so your going to have a truly tropical living experience at Villa Sky. The decor is stylish and chic with a real interior designer feel to the furnishings and surfaces which are earthly tones. 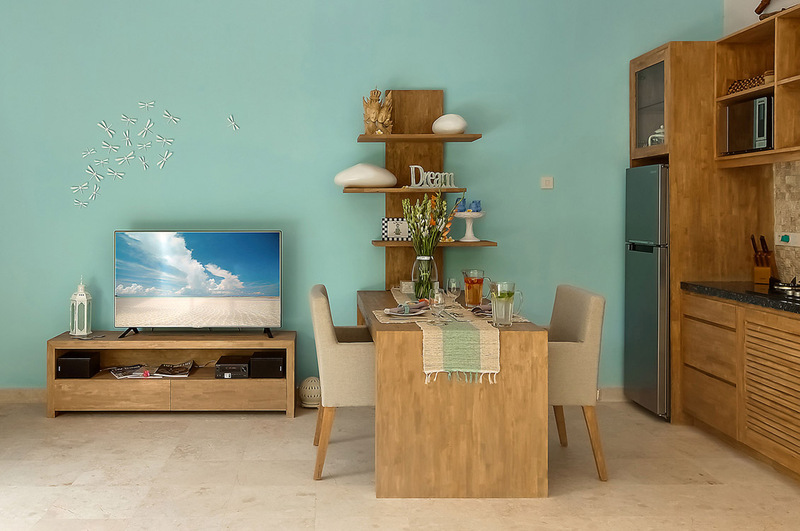 The kitchenette is well equipped if you want to do some cooking and a large LCD TV has satellite channels so you can watch movies, sport and the like. 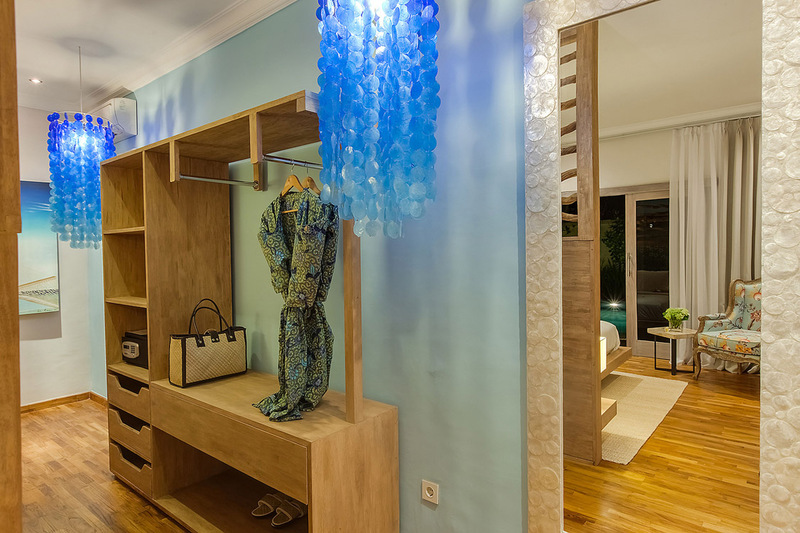 The bedroom is beautifully appointed with the same designer decor theme as the living areas. 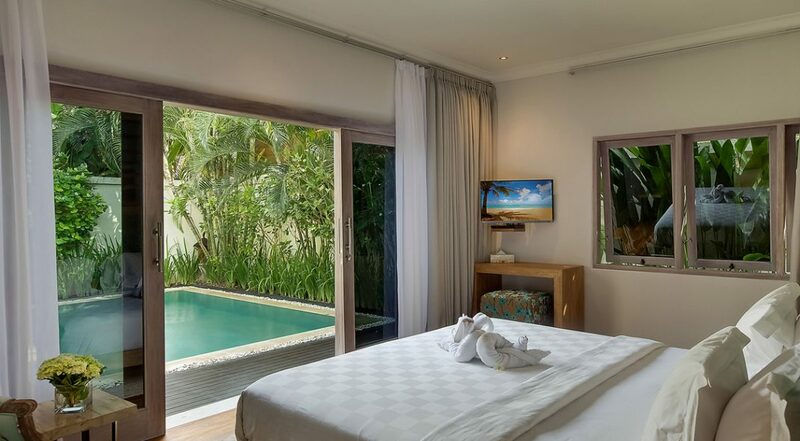 A premium king size bed is positioned in front of glass doors opening onto the pool. 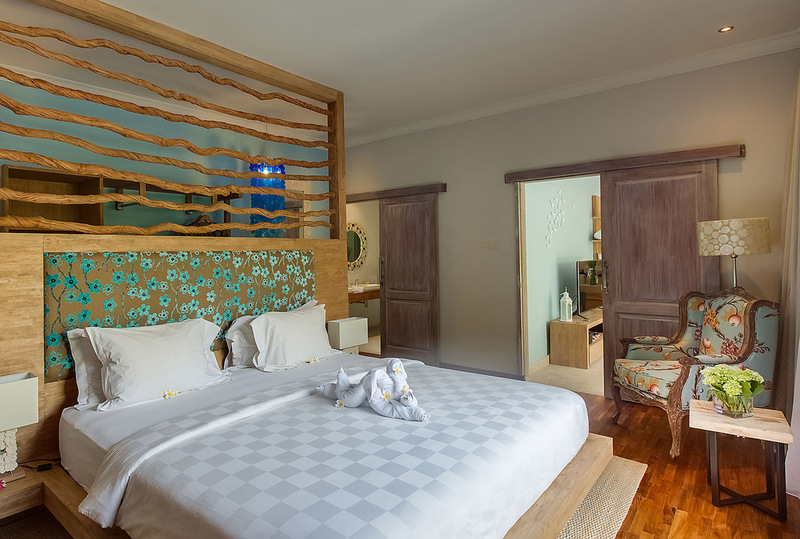 The room features lovely timber flooring and furnishings with subtle pastel hues throughout, a wall mounted flat-screen provides entertainment. 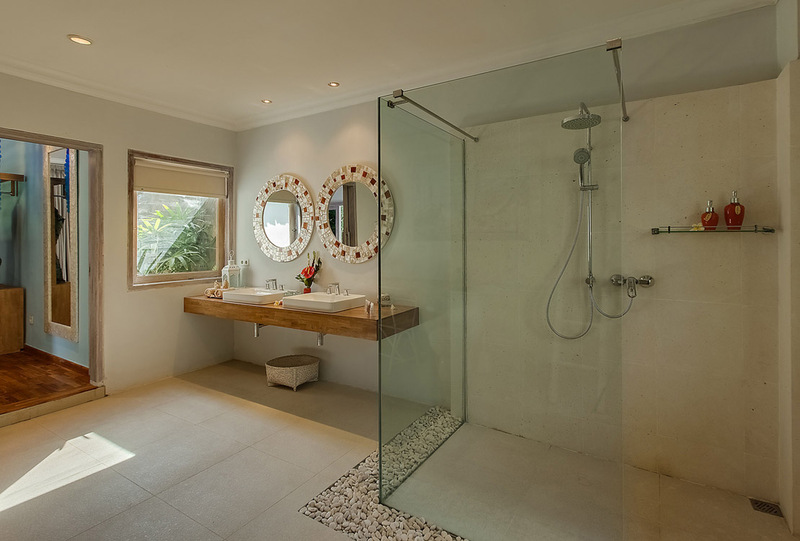 The en-suite has a large monsoon shower, soaking tub and twin vanities. 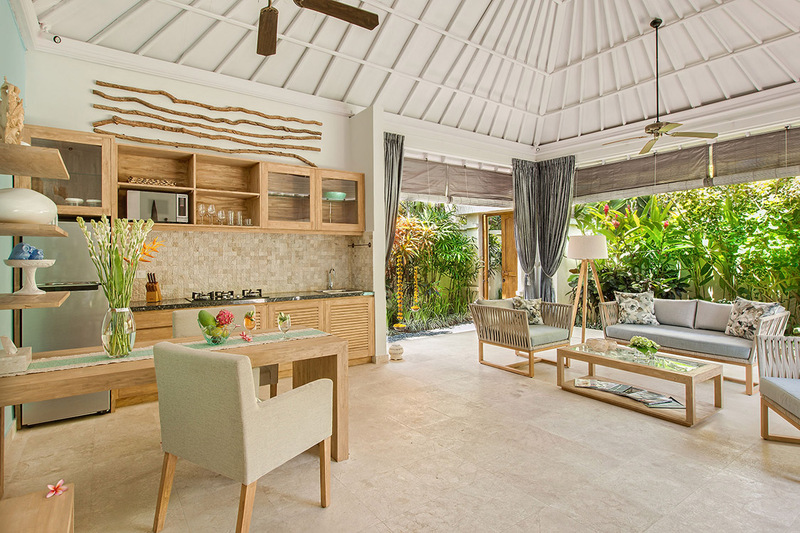 The villa will be cleaned each day and you can enjoy breakfast each morning prepared by the staff. Don’t hesitate to ask the staff for any assistance whatsoever they are warm, welcoming and obliging. 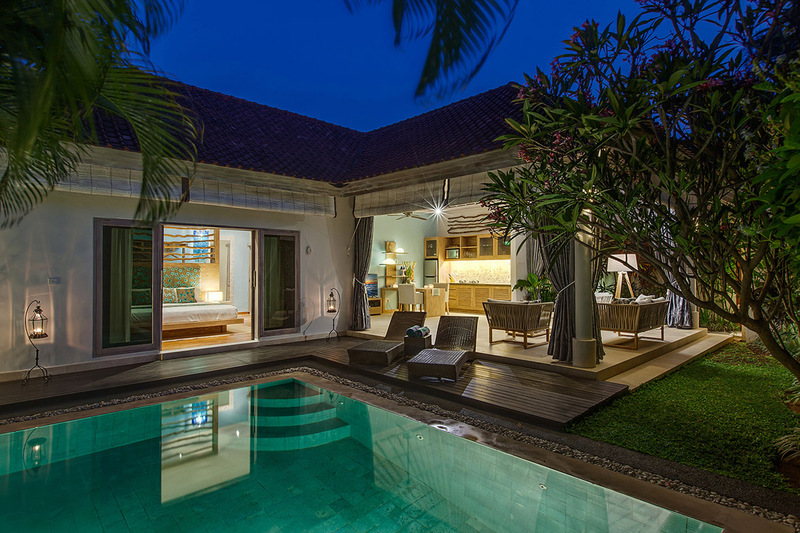 Villa Sky boasts an exciting location, tucked away in a quiet lane the villa is just a few meters from Bintang Supermarket on Jalan Raya Seminyak. Here you will find ATM’s, cafes, restaurants, boutiques, handicraft and novelty shops of every description. You can walk to the beach along Jalan Arjuna bringing you to Double Six Beach and Cocoon Beach Club. Near to the villa, Ryoshi has great Japanese food and the Queens Tandor does great Indian fare. If you need a coffee fix then the popular Revolver cafe is nearby. If your into Yoga then Jiwa is about 5-10 min away by taxi. If you love your shopping then your in luck as Seminak is the shopping heart of Bali. Head to Seminyak Village or Seminyak Square and start your shopping journey from there. For an amazing sunset experience go to Ku De Ta or Potato Head which are the two main sophisticated beach clubs in Bali. Enjoy cocktails, fine dining and a great vibe as the sun goes down. 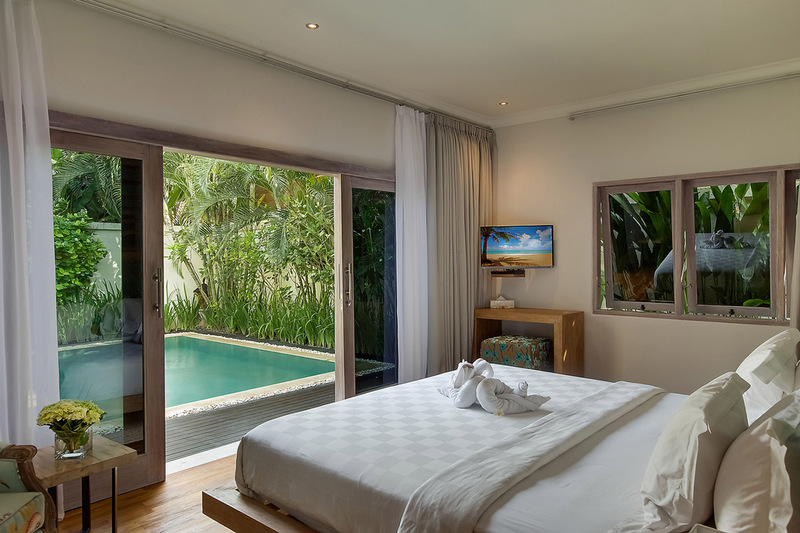 To view other Bali villas near Ku De Ta or our full range of 1 bedroom romantic, honeymoon or couples Seminyak villas please browse this website or contact our reservation team. 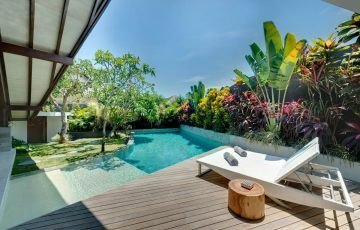 Book your Seminyak holiday at Villa Sky well in advance as this is a popular villa, especially if your planning a trip to Bali during the Australian school or public holidays. Fantastic choice for the 2 of us as it was private, clean, very modern and in a really great position. My wife and I could easily walk to all the restaurants & shops nearby in Seminyak Square which was very handy as she does love to shop. We were also pleasantly surprised at just how peaceful and low key the villa was - we could not hear any noise at night. The was perfect for the 2 of us and we could not have asked for anything better. 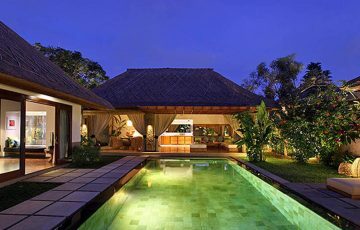 My boyfriend and I stayed in this villa for 5 days and it was bliss - not to mention very romantic. The staff were brilliant and made sure we were as comfortable and well fed as possible. There was even security 24/7 which is an added bonus. Thx Putu - we loved your breakfasts every morning! 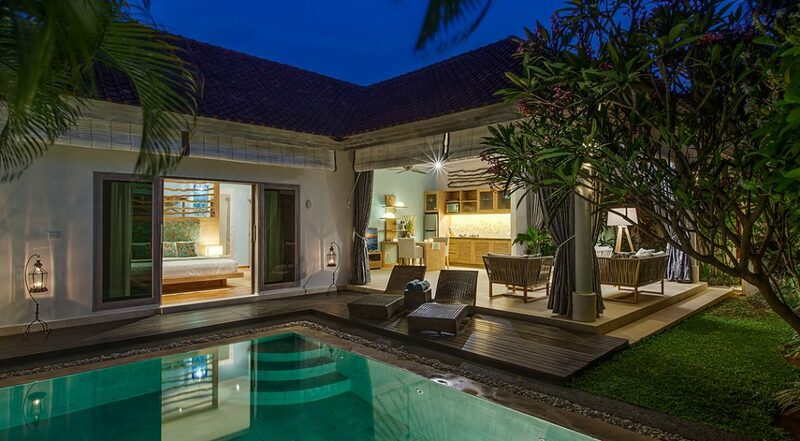 I also want to add that the location of this villa was superb with Seminyak on our door step. Can't wait to come back here next year - we are counting down the days. Amazing villa - loved every second here and enjoyed the privacy. This was so much better than we thought and we are already planning our next quick weekend trip. 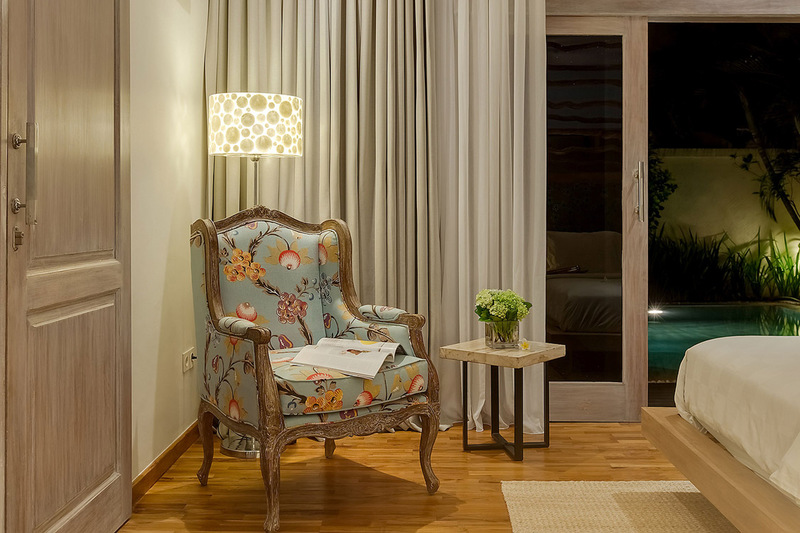 Came here with hubby for 6 days and loved the location and the cleanliness of the villa. 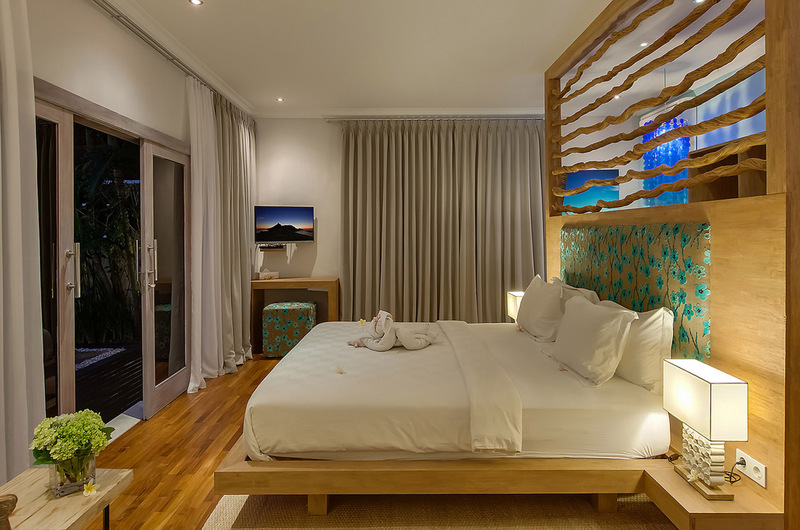 So private and really quiet,, you would never know that your in Seminyak. Loved the free breaky and the extra touches by the villa staff like putting frangipani flowers on the bed. A fabulous time and to be honest quite affordable. I stayed at villa Sky for a wonderful and very relaxing 8 days with my fiance. The place is pristine, so comfy and the ensuite is gorgeous. Best romantic villa I have been in for a long long time! Love the pool and the way everything is so private. 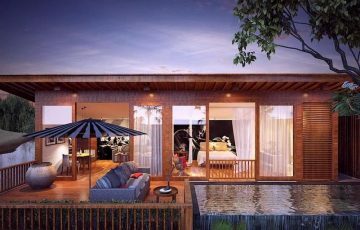 My boyfriend & I stayed in Villa Sky 1 bedroom pool villa this Sept (2018) & we had the best time! Complete privacy, professional staff that were there to do anything for us. Even some shopping for groceries. There was a freindly security guard who greeted us each night when we came back from dinner with a happy smile. 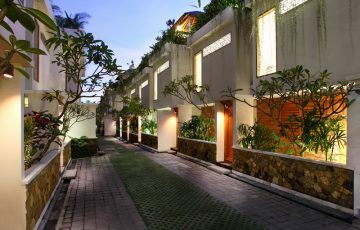 Sky is located in such a top Seminyak area. Close to lots of really nice and casual restaurants. Perfect for the 2 of us. 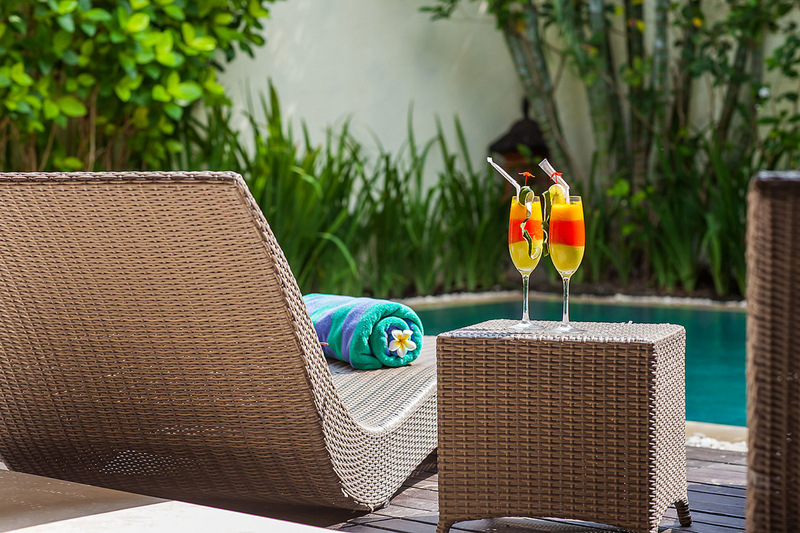 A really quiet and pleasant place to spend quality time with your partner.